I've profiled numerous people in the past but how could I have forgotten to write about Tom McCahill? The first published road test in America was conducted by McCahill and appeared in the February 1946 issue of Mechanix Illustrated. (Interestingly, early Motor Trend magazines didn't dare use the term 'road test.' Instead, MT employed the Anglophillic phrase 'motor trial' until 1952 or so.) The first car he road tested was a 1946 Ford DeLuxe sedan. Unk tested cars using nothing but a stopwatch, a heavy right foot and the seat of his pants. His prose was legendary; he compared the handling of a 1957 Buick to "a fat matron trying to get out of a slippery bathtub." The swivel seats on the '59 Imperial were "as easy to get into as a floating crap game." He once wrote that a 1952 Morris Minor sedan had an engine "the size of an alarm clock." 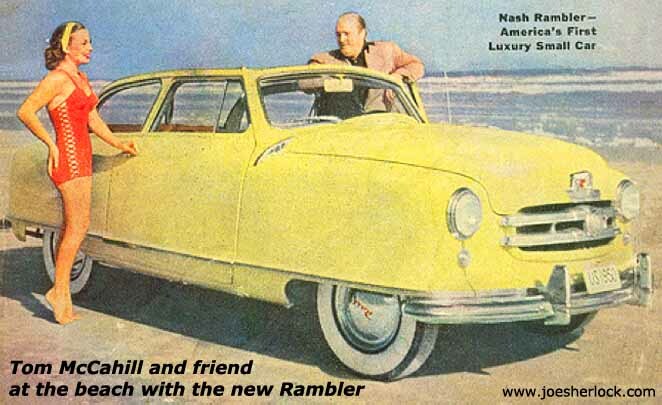 A 1953 Kaiser was as comfortable as "a wheelchair upholstered in cream puffs." He tested a '59 Jaguar XK-150 and opined: "Anyone taller than a case of scotch would have trouble finding footroom." A 1950 Pontiac he tested was as "stripped as a newborn oyster in a hurricane." About the quality of the '50 Jag XK-120, he noted "It would have been better if they had just shoveled the unassembled parts into an old bag and shipped them parcel post." Cornering the '52 Nash was like "steering a three-acre lot." Unk once remarked that, in their quest to make things more complex, the Germans "wouldn't have been able to restrain themselves from painting a mustache on the Mona Lisa." Early tubeless tires had "more lumps than a seven-second mashed potato." When asked by a high-school English teacher to cite examples of modern, enduring prose, I brought a copy of Mechanix Illustrated to class. The teacher was unamused by Uncle Tom's writing. Nevertheless, I considered McCahill a remarkable wordsmith with a great sense of humor. He had something new, interesting and outrageous to say every month. Later, MI added another regular feature, 'Mail for McCahill', in which Uncle Tom answered questions and offered advice. When queried about oil additives, McCahill dismissed them as "mouse milk." Mike Davis, writing in TheCarConnection.com, offered interesting observations about Tom McCahill: "I had the opportunity to worship at McCahill's feet in 1953, when the Yale Sports Car Club invited him up from New Jersey to speak. He arrived in a sleek black Mexican Road Race Lincoln coupe, accompanied by his pair of equally sleek black labs. Much to my surprise, he was badly crippled, moving with a serious limp, assisted by a cane." McCahill had been hurt during a football game while at prep school. The injury left one leg shorter than the other. Davis continued, "Later, McCahill operated from Ormond Beach, north of Daytona, and if an auto company PR department wanted to get a test report of one of its cars into Mechanix Illustrated, it had to deliver one to his relatively remote home. Once, during my Lincoln-Mercury years, we achieved a glowing review of a new Comet V-8 from McCahill in Mechanix Illustrated, but the puzzled district office - which had to deliver and retrieve the car - told us only a few miles had been put on the odometer while it was in his hands. Probably just enough to stage the photos for the article." Personally, I would prefer to believe that 'ol Uncle Tom disconnected the odometer just to jerk Ford's Public Relations department around. According to Canadian automotive historian Bill Vance, late in life McCahill lost a leg that became gangrenous after a thorn penetrated it during a duck hunt, forcing its amputation. Between 1946 and 1975, Tom road-tested over 600 cars. He was a genuine force in the auto industry; his words could make or break a new model. His rants and recommendations inspired manufacturers to offer better-handling, more powerful automobiles. In 1956, Packard president Hugh Ferry told Tom, "We never really liked you, but we always respected you." "It was," recalled McCahill, "the finest compliment I ever received." Tom McCahill died at his home on May 10, 1975 at age 68. At the time of his death, he was reportedly the only living descendant of the notorious Scottish highwayman Rob Roy. Mechanix Illustrated never publicly acknowledged McCahill's death, fearing that, without Unk, the magazine wouldn't survive. For a while, MI ran a column called 'McCahill Reports', which was ghostwritten by Tom's stepson. Automobile Quarterly did produce an article (by Richard M. Langworth) about Unk six months or so after his death; that's how I found out that this writing legend was no longer with us. Former Popular Mechanics' automotive editor, Don Chaikin was a McCahill contemporary early in his career. 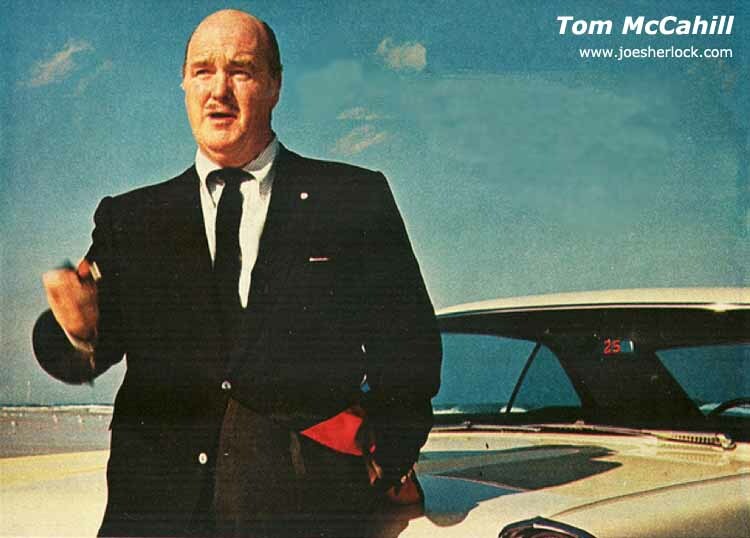 Recalling Tom's unique writing style and his basic, honest approach to auto testing, Chalkin said, "Clearly, he was a gentleman of a different era." And what an extraordinary gentlemen he was. Tom McCahill was a grand pioneer in the not-so-grand field of automotive writing. He made a significant impact on the auto business as well as the many auto enthusiasts and would-be writers he inspired.